Rice & Rose is proud to be a Gold Sponsor, once again, for the annual Spaghetti Dinner, which will be held this year on Saturday, January 31, 2015, from 10:30 am to 6:00 p.m. at the New Smyrna Beach High School. This is the 10th year that Rice & Rose has helped sponsor this event, which is an annual fundraiser to help raise money for college scholarships for deserving high school seniors through the New Smyrna Beach CAPS (Community and Alumni Providing Scholarships). 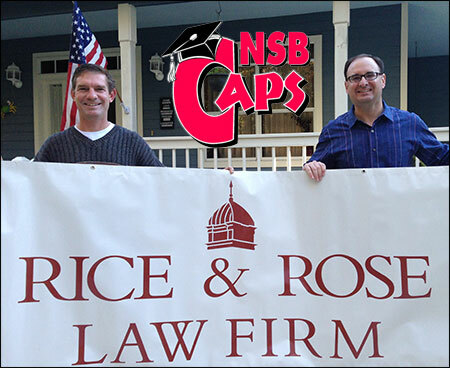 Over the last 10 years in which Rice & Rose has been a part of this event, New Smyrna Beach CAPS has delivered over $500,000.00 in college scholarships. Pictured is Shawn Lane (pictured left), program chairperson, and Rice & Rose Partner, Philip Bonamo (pictured right). Both Mr. Lane and Mr. Bonamo are graduates of New Smyrna Beach High School.